I’m guessing that many people have been following the Rio Olympics that are underway, with the first week almost done. Given all the problems leading up the Games, it was a relief that it finally started though there have been a few disturbing events. But in terms of sporting achievements, there’s also been a few moments of excellence. While it’s normal for the Olympics to be beset with problems, the Rio games probably set a new record, putting all the issues with previous Games in the shade, from pollution to crime to the athletes village being incomplete days before the Olympics started. And even the sports hasn’t been free of controversy, with Russia’s doping scandal casting a shadow on events. In swimming, there was a bit of a spat between an American swimmer and a Russian one who had twice been caught doping but was still allowed to participate. American Lily King ended up beating the Russian Yuliya Efimova who then fired back saying that she thought the Cold War was over. However, the doping drama also extended to China, specifically Sun Yang, supposedly China’s greatest male swimmer. Sun won China’s first-ever Olympic gold medals in men’s swimming in 2012, but he got caught up a few dubious activities like getting into a car crash while driving without a license and being accused of kicking a female swimmer in training before an event. However, it was the fact he was suspended for using an illegal drug in 2014 (which was only announced by Chinese authorities after he had served the ban) that riled up a rival Australian swimmer. Mack Horton, who previously could have passed for a mild-mannered Harry Potter nerd, turned out to be, calling Sun a drug cheat while beating him in the 400m freestyle. Sun cried after losing, leading to Chinese fans, media and sporting authorities engaging in the mother of all hissy fits. What was supposed to be trash talk between athletes almost turned into an international incident when China’s swimming federation demanded a damned apology from Australia. To which the Australians wisely refused and said not at all. I’m really wondering Chinese authorities and netizens are losing their grip on reality when they get their feelings hurt over any issue involving China and see nationalistic controversies everywhere. It’s not just the athletes causing controversy. There has even been a bizarre phenomenon with the water in the diving pool turning deep green, which not only got worse, but has seen a second pool develop the same problem. The probable cause is algae but whatever the case, it looks horrible. But, not everything was so grim with swimming. Here’s something kind of hilarious involving Michael Phelps’ eerily sinister resemblance to Anakin Skywalker after he went bad while ignoring a dancing rival. Congratulation to Taiwan for winning three medals so far including one gold. Unfortunately, Taiwan competes as Chinese Taipei and flies a flag that is not the national one, as it also does in international football, due to the dark influence and pettiness of China which insists that Taiwan belongs to it. Yao Ming’s been gone from Chinese basketball for over a year now, and Wang Zhizhi, as well as 3 other mainstays, is now gone too, at least from playing for the national team in the Olympics. NiuBBall is an English-language site about Chinese basketball and it’s got some good articles on the Chinese men’s team’s dismal performance at the just-concluded Olympics, including grading the players and commemorating the coach who stepped down recently. The team lost all their group games, finishing dead last in their group, and failed to reach the quarterfinals for the first time since 2000. With only one NBA player in the lineup, Yi Jianlian, (a 7-foot Cantonese from Heshan), China wasn’t expected to do that well. And when Yi suffered a knee injury in their third game, the writing was on the wall. Yi played well when he was healthy and he’s been the man since Yao Ming left, leading the team to the Asia Games and Asian championships crowns, but he’s not as good as Yao, and unfortunately other people haven’t stepped up. It wasn’t that long ago that HTC was one of the top smartphone brands. That’s why I was surprised recently to learn that the Taiwanese smartphone maker is in a lot of trouble, to the point where its current worldwide market share has dropped almost in half from 11 percent in 2011 to 6 percent now (it’s also seen similarly drastic drops in quarterly and monthly revenue). HTC’s seen huge drops in sales in North America and Europe, so it’s now looking to China to save itself. Samsung, on the other hand, has been doing great whilst eating into HTC’s sales and market share. The reasons for HTC’s struggles include too many models (hmm, wonder why this sounds familiar concerning Taiwan brands? ), technical issues, less retail sales channels than Apple or Samsung, and patent fights with Apple, though HTC actually won recently. When I bought a new phone last year, I specifically got a HTC smartphone instead of an iPhone or a Samsung or Nokia, mostly because of a desire to support a top Taiwan brand (see, I do support Taiwan in some ways), but also because HTC had several good models out. If it only had crappy phones, I wouldn’t buy it no matter how much local pride I had. I still want HTC to do well, because it’s cool for a local company to be a quality brand and be successful worldwide. HTC’s one of the rare Taiwanese companies that is well-known in the US (it was the first to offer Android phones), with Acer and Asus not quite there yet. Neither are ZTE or Huawei, mainland China’s telecom equipment companies. South Africa put itself back into the world’s top news in a major tragic way last week. After a protracted standoff between striking workers ad police at a platinum mine, 34 workers were killed and dozens injured by police. This is a huge tragedy for the South African people and a big blow to the government, who literally have blood on their hands in an event that seems reminiscent of the violence during apartheid. Yet the violence at the mine was sparked by clashes between workers of rival trade unions the week before, in which 2 police officers were even killed. It doesn’t mean the police shooting was justified, but it sadly demonstrates that violence and murder are common in South Africa. It’s a beautiful, diverse country, but there are serious issues concerning inequality, poverty, and corruption that this tragedy has brought to the fore. A few posts back, I referred to foreigners who gush about Taiwan and the people here. Well, not every foreigner does, such as this journalist who often makes sharp criticisms about issues that many people don’t talk about, but are pertinent, and this other guy here, who also makes some great observations and criticisms of the, to put it mildly, the eccentricities in Taiwan. I’ve been reading both off and on for a while now and the first guy’s latest post hits the mark well. I’m not so big on some of the cultural anti-Chinese criticisms, but at least it’s directed against both sides and not the far-too-common heavenly Taiwanese, hellacious mainlanders trite. Also, there are a lot of good things here to praise and gush about, but let’s not be blinded to the fact there’s a lot of nonsense here as well. Here’s some splendid photos of Chinese jet fighters conducting training in the Southwest. No chance of these being Photshopped, I hope, like the second one. The J-11 is the Chinese version of Russia’s Sukhoi Su-27 Flanker, basically a counterpart of the USA’s F-15 Eagle and F-16 fighters. And staying on the topic of lovely images, Miss China Yu Wenxia won Miss World on Saturday, which actually took place in China. Interestingly the competition was in Ordos, Inner Mongolia and not sandy tropical Hainan. If Ordos sounds familiar, that’s because it’s the site of the infamous “ghost town” where thousands of news homes have been built but hardly anyone lives. To clarify a bit, the entire city is not deserted, it’s a prosperous mining town. The actual ghost town is a district in the town which has seen development run rampant and exceed actual residents by a huge amount. The past few days have highlighted the fact that there’s an ongoing spat between South Korea and Japan over some small rocks in the East Sea (the sea between these 2 countries). The spat even spilled onto the just-concluded Olympics, causing controversy in the bronze medal football game between these very 2 countries. The Koreans call them Dokdo and the Japanese Takeshima. These rocks are uninhabited but lie on fishing grounds and over potential oil fields, which is probably the main reason for the dispute. South Korea’s President Lee Myung-bak did a bold, or even provocative, act in actually visiting these rocks on Friday, while at the Olympics, a South Korean player held up a flag proclaiming Korea’s ownership. Besides the fact this dispute seems to be significant, one main reason that I’m bringing this up is that at the 2010 World Cup, I saw this after South Korea’s group game against Nigeria. At that time, I had never heard of Dokdo and didn’t know what this was all about. I thought it was some obscure territorial issue, but what’s puzzling is that the guy holding the banner is wearing a blue Japanese football replica shirt, as well as the Anti AIDS message below the Dokdo one, written as if to lessen the controversy of this statement, and the silly “headgear”. And then, when I went home and looked through my pictures from the game, I saw this wasn’t the first banner that day about Dokdo. 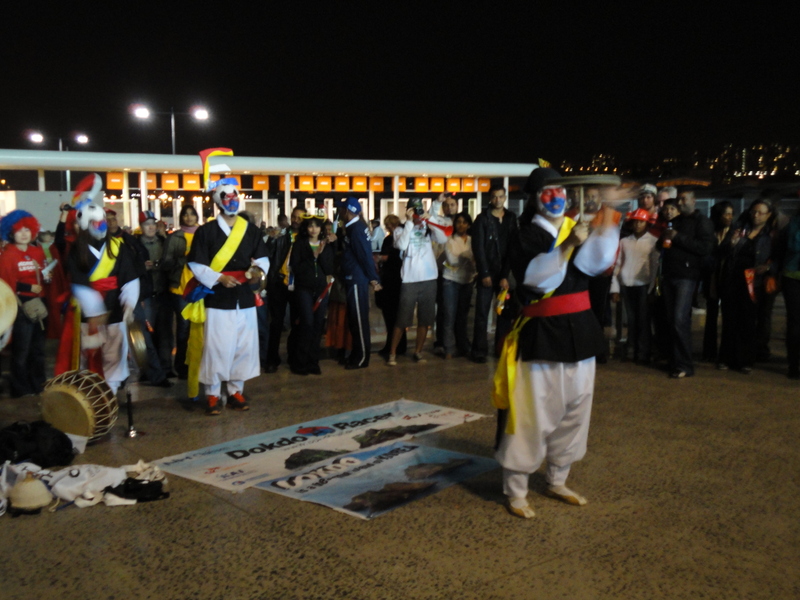 The below pics were taken of a Korean performance right before the game within the stadium grounds. The group did some nice dances and played some instruments as well gave a taekwondo demonstration involving volunteers from the crowd. Yet they still used this moment to proclaim their nation’s right to “Dokdo”. This “Dokdo” dispute also demonstrates something about East Asia. While many people like to see China as a supervillain, countries all over East (and Southeast) Asia have gripes with each other over territory and history. Even in the South China Sea, while China’s claim might be kind of excessive, a multitude of nations, and even Taiwan, are arguing over islands in that area. On the topic of island disputes, Taiwan even has a dispute with Japan over some islets NE of Taiwan which saw a minor incident recently. Meanwhile Thailand and Cambodia actually fought a minor war last year over a disputed piece of land on their border. And coming back to Japan, it’s also got a dispute with Russia over the Kurile islands, which were seized from Japan at the end of World War II. A lot of these Asian nations have a long history, and taking into consideration cultural values and traits, and often wars and disputes linger strongly in people’s minds. Meanwhile Singapore is also struggling with anti-China feelings. It seems that many Singaporeans don’t seem to be feeling too kindly towards mainland Chinese in their tiny country, which is especially jarring since all their medal winners in the 2012 London Olympics so far are mainland Chinese. Meanwhile this NY Times article talks about the need for change in China, which even has offspring of the Chinese elite worried. It’s kind of old- July 17- but the article is kind of interesting though not too surprising. It’s well known that China’s political system needs some change, but what kind and how much are still being debated. By now, Liu Xiang’s exit in the 110m hurdles has been shown and written about all over. Liu, the 2004 gold medalist, hit the first hurdle and went down immediately unable to continue. He limped off the track to the exit, but then changed his mind and went back alongside the track and hopped to the finish line. This was almost a repeat of 2008 when Liu wasn’t even able to start the race. Liu Xiang was a trailblazer, being the first Chinese man to win an Olympic track event. Before Li Na, before Sun Yang, both of whom also were Chinese sports trailblazers, there was Liu Xiang. He’s probably still the only Chinese, maybe even East Asian, medalist in Olympic track event. I was quite sad as well, though not as much as many Chinese, but I was heartened by the reaction from these same fans. Instead of reacting with anger and vitriol, many Chinese were sympathetic and supportive, a big change from 2008 when Liu faced a lot of criticism. Liu, you carried the hopes of an entire nation of over one billion and regardless of the outcome, you are an inspiration and a true Chinese pioneer. Here’s to either a dignified retirement or a successful comeback. On the other hand, there’s been growing concern over China’s strong focus on winning golds and the huge burdens and pressure on Chinese athletes. There’s a draconian element to it, especially with the role of the state in the athletes’ training and the single-minded dedication of many athletes, not that this doesn’t exist elsewhere including in the West. Many Chinese are aware of this and have been speaking out on it, with even state newspapers having their say. I was surprised to read about Li Ning, the famous gymnast who has his own brand, receiving hate mail at his home after a medal-less Olympics in 1988. Well, days after complaining about the sheer number of stray dogs in Taipei, I saw this story and realized maybe, just maybe, it’s not so bad in Taipei. More than just nuisances, strays in Delhi have been terrorizing the streets, sending multitudes of people to hospitals to seek treatment for bites. And to counter the critical news and opinions of Taiwan, here’s one good thing about Taiwan, though only for some people. Today was a day of nonstop rain and gray skies, and a welcome respite from work, courtesy of the incoming Typhoon Saola which is taking its sweet time passing through Taiwan. Basically the whole of Taiwan got to have a day off from work and school, with dozens of flights and train services cancelled. While many of us in Taipei were fortunate to enjoy a day off without much worry, there was serious flooding and landslides in some areas and a few deaths. The typhoon is moving towards China so there might be more damage and casualties. The American swim coach who first criticized Chinese teen double-gold medalist Ye Shiwen for her “disturbing” performance still isn’t holding back on his suspicions, coming up with more shady allegations about Ye supposedly holding back in her other races. I suppose while he’s at this, he might as well start looking into other great performances from other teen swimmers, like the 15-year-old Lithuanian girl who won gold in the 100 m breaststroke or 17-year-old American Missy Franklin who won the 100 m backstroke. I’m not suggesting these girls are doping, but that Chinese success should not be regarded with such suspicion while similar success from athletes of other nations are treated as so wonderful. Meanwhile, here’s a decent story on Ye Shiwen’s childhood and beginning of her swim career. Ye defends herself against her critics, as she very well should, though I don’t think she really said sour grapes unless there really is that term in Chinese. A massive power cut affected half of India on Monday and Tuesday, leaving over 600 million without power. If ever there was a sign of India’s serious infrastructural deficiencies, this is it. Having said that, I did experience the unbelievable power blackout in Toronto in the summer of 2003, when the entire city had no power and I had to go line up to buy bottled water at a neighborhood grocery in the evening. This blackout, itself one of the biggest in history though paling in comparison with the Indian one, hit parts of eastern US and Canada and lasted for about one day.